You're kidding me right?!? What in the f*ck was Chris Shays' campaign manager thinking? A federal grand jury investigating the disappearance of up to $300,000 from U.S. Rep. Christopher Shays' re-election campaign has subpoenaed the veteran congressman's former campaign manager, Michael Sohn, of Fairfield, the Connecticut Post has learned. Sources with knowledge of the probe said the investigation is centering on Sohn's control of campaign funds used to pay vendors and campaign staff. The campaign scandal has prompted several state Republicans, none of whom wanted to be identified by name, to believe that Sohn may have used Shays' re-election funds to gamble. In fact, the investigation could include at least one withdrawal from an automated teller machine in one of Connecticut's Indian casinos. Both the Federal Elections Commission and the U.S. Attorney's office declined comment Friday. But people with knowledge of the investigation said a grand jury has been empaneled in U.S. District Court in New Haven and that Sohn has been subpoenaed to testify. Shays is not commenting, but friends say the veteran Republican congressman is distraught over the possibility that his campaign manager, a seven-year employee, may have taken the money over a period of about two years. In Washington, Congressman Chris Murphy was appointed to the prestigious and powerful Energy and Commerce Committee for the 111th Congress. Congressman Murphy is the first member of the Connecticut Delegation to sit on the Energy and Commerce Committee since 1996 and the first Democratic member in over 20 years. “I am thrilled to have been appointed to a committee that will allow me to play a major role in expanding access to health care, combating global warming, and making our country truly energy independent. In particular, health care reform has always been an issue central to my public service, and this appointment gives me an opportunity to continue the work I started as Chair of the Public Health Committee in Hartford. “For the first time in over a decade, Connecticut will have a seat on one of the most influential committees in Congress. Under the leadership of Chairman Henry Waxman and President-Elect Obama, the Energy and Commerce Committee will be at the center of the most important policy debates of the next two years. I look forward to being Connecticut’s voice at the table as we construct landmark health care and energy reform legislation. On the state level, the House Democrats chose their leaders today as well as committee assignments. Incoming Speaker of the House Chris Donovan (D-Meriden) appointed State Rep. Bob Godfrey (110th Dist) as Deputy Speaker. State Rep. Jason Bartlett (2nd Dist) was appointed by Donovan as Vice Chairman of the Appropriations Committee. Fot those who don't know, the Appropriations Committee deals with matrters relating to the state's budget so Bartlett's position is great for the Danbury area. Not to be outdone, Donovan appointed State Rep Joe Taborsak (109th Dist) Vice Chairman of the General Law Committee. Next week, the Democratic State Central will meet and vote on the pending censure resolution against Joe LIEberman. As you know, the Danbury Democratic Town Committee supported censuring LIEberman while not calling for him to resign from the Democraitc Party (you can read my post and video footage on the DTC's vote by clicking here). If you haven't signed the online petition in support of the resolution, I recommend that you sign up and express your outrage over the appaling actions of our junior senator against President-Elect Brack Obama and the Democratic Party during the campaign season. Attended the last of Mayor Boughton's community forums which was held at the Magnet School last night. As someone who has attended all of the forums, I was greatly diappointed at the god-awful turnout at this event (seeing that the turnout at the other forums were MUCH higher). I'd recommend that, in the future, if a forum is to be held by ANYONE in the 7th ward, that they do it at a better location that easier to get to such as the Mill Ridge School. I'll probably post the video from the forum sometime this weekend. FRIDAY. THE WINTER STORM WATCH IS NO LONGER IN EFFECT. UPDATE: Seems like we weathered the storm as higher temperatures are frocasted for tonight...which means we'll be dealing with rain as opposed to ice. (Post bumped to the top with additional info). Did you know that there was a public hearing on the changes to the charter revision today on Monday? If your answer is "no" then your not alone. Out of a city of aprox 75,000 people, only three people, or 0.0004 percent of the population of Danbury spoke at the hearing! ...a PUBLIC meeting that was set at the ridiculous time of 6:30 when MOST OF THE PUBLIC is coming home from work might I add!!! (FYI: one has to wonder if the meeting was set for the comfort of the commission of the public). Now, let me explain WHO spoke at the meeting and then you'll understand when I say NO ONE from the general public actually spoke at the meeting. Like I said ONLY THREE people spoke at the meeting..Joel Urice, Lynn Waller, and Greg Williams. 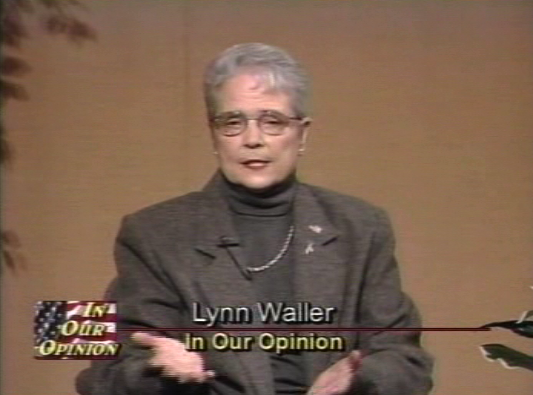 Lynn Waller is the producer/host of a local access show in the area and has made it a habit to attend numerous meetings at City Hall for a number of years. 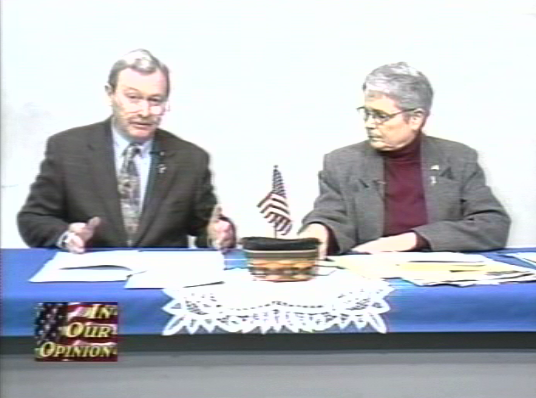 Her co-host, Planning commission member Joel Urice, (a person who's known better for his boneheaded offensive and racially insensitive emails against immigrants that he doesn't regret forwarding to people) has also attended a number (if not majority) of the revision meetings and commented about the topic on Waller's show. Since these two individuals attended a great number of meetings, and talked about the subject numerous times on local access TV, it's clearly logical to assume that they would be at the public hearing offering their two cents on the revision to the charter. Let's move onto the other person who spoke at the meeting...former Republican Common Council member Greg Williams (pictured in the left image below). 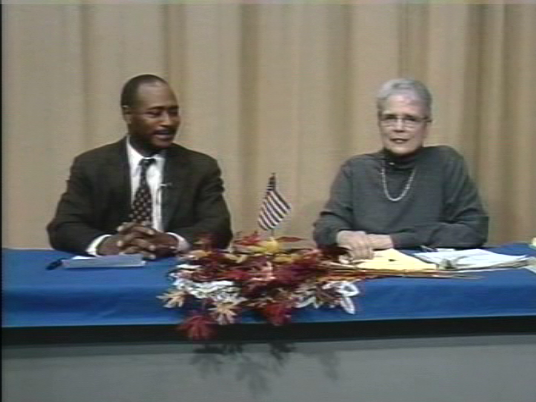 During the Thanksgiving break, Williams, a former co-host for Ivon Alcime's show "Ideas at Work and Beyond", filled in as co-host for Urice on Waller's show. During that particular episode, Waller mentioned the public hearing and noted that she was going to interview the chairman of the charter revision commission, Carlo Morano, and broadcast that interview next week (last Friday). Since Waller tapes two shows per week, she interviewed charter revision Chariman Morano the same day she taped the show with Williams (take note of Waller's shirt and necklace in the above four photos). 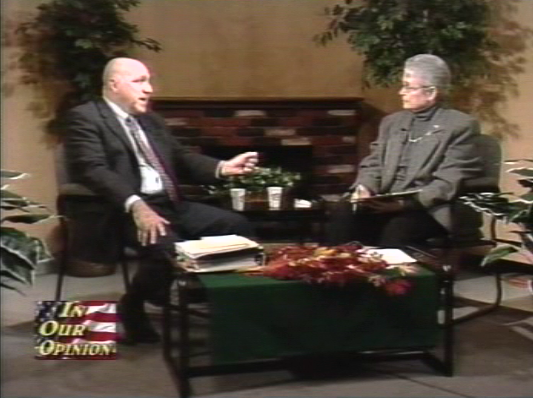 It's rather fair to assume that Williams (again, a former Common Conncil member) was in attendance at the taping and decided to attend the meeting based from his participation with the show on that day (which was verified by his remarks at the public hearing where he thanked Waller for providing him with tapes of the meetings). I can hear you know...well, they're members of the public right? Well, not exactly. You see, when you talk about members of the public, it better to exclude activists or people who follow local politics as they're outside of the norm when it comes to the GENERAL public. You're always guaranteed to hear a comment from people like Waller at most meetings (not that it's a bad thing BUT if she's the only person you're hearing, then can she be considered a good sample of the GENERAL public?) Whenever you see yours truly speaking in front of a commission of board (as I have on several occasions), it's fair to say that I'm not a member of the general public because I follow this political crap stuff much closer than the normal guy walking up or down the street AND I talk about it on this site on a daily basis. In short, my opinion (right or wrong) can't be considered a sample of the viewpoint of the general public just as much as the people who spoke at this particular public hearing. That being the case, this ENTIRE public hearing was a COMPLETE waste of time because it served no purpose than to hear from the same members of the public that have already spoke at EVERY OTHER CHARTER REVISION MEETING EVER HELD to date. Now that's not to diminish what they do BUT even those who were in attendance would testify that the so-called turnout at the meeting was a joke...and definitely did not warrant a front page article where the chairman offered these remarks. "Your input has been valuable throughout this process," he said. I mean come on! I've watched every single one of the charter revision meetings (either attending them or catching them on TV) and I would hardly say that the input of two or three people made a great difference in terms of what was offered in the draft report. I recall members of the public express opposition towards having a four year term for elected officials (while the rationale from elected officials favoring four year terms making NO SENSE whatsoever. During the first public hearing back when the commission was established, a number of people spoke about the gross violations of the charter committed by the mayor and the need for sometime to be done so that there would be some type of penalty for violating the charter. That was to my knowledge, never addressed. I could go on and on but problems I have with the commission's decisions but now is not the time for that...I'm saving that discussion (and break down) for next year. For now, this post is only meant to illustrate the laughable attendance at Monday's meeting and why it was worse than was reported by the News-Times. For your viewing pleasure, here's video of the pubic hearing from Monday night...view for yourself. 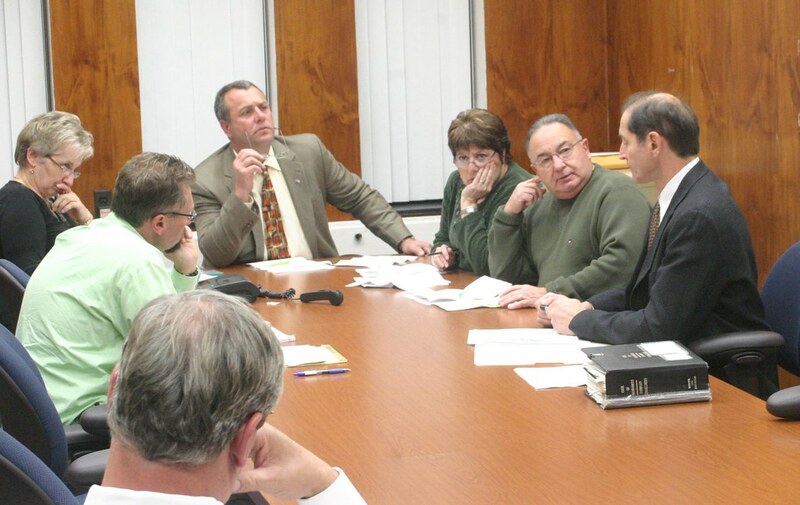 Over many years, public participation in public issues has diminished in Danbury. Voters are busy, public input is often not encouraged by city officials and people get the message that their opinion doesn't count. The Charter Revision Commission proposal to switch from two-year to four-year terms for elected officials is another example that City Hall is tone deaf when it comes to honoring the public's voice. What's wrong with expecting elected officials to ask the voters for backing every two years? Why would City Hall want to discourage public participation? Proponents of this change claim government jobs in the city of Danbury are so complex that they require a four-year term so those elected can have time to figure out what they're doing before they run for re-election. Goodness. No one should run for office if they think it will take them four years to figure out what they're doing. The presidency of the United States is a four-year term, but those running for president never claim they need four years to figure out how to do the job. Democracy is messy and running for office can be demanding. That's at the heart of this charter proposal. The politicians don't want to run every two years. There is no groundswell of public opinion demanding fewer elections and four-year terms for politicians. Yet the Charter Commission is insisting Danbury needs this change because the politicians want it. All right, all right, all right...enough about the fight!!! You guys are too much. Everyone wants to see the video footage from the brawl between the Brooklyn Aces at Danbury Mad Hatters that went down on 11/29. Since you guys twisted my arm enough, here's a collection of videos from that night. If you have video from the brawl, contact me at hatcityblog@yahoo.com with a URL to the clip and I'll add it to this post. The brawl will also be broadcasted tonight on the local access show "Spotlight On" at 9:00 PM (I'll add the footage from the show to this post tomorrow). UPDATE: This new angle from the local access show "Spotlight On" shows what happened moments before the fight. Leigh Overland is an architect from Danbury who's better known for designing the house in Bridgeport for the ABC hit series Extreme Makeover. With the economy is the toilet, Overland came on WVIT's Connecticut Newsmakers to talk about the construction market and offers from rather interesting information. You see, a great indicator of the economy is construction market...you see, it's probably a bad sign (economically speaking) if people aren't building stuff. From time to time, people ask me how a particular item, such as an ordinance, becomes law. Most people don't understand the process in which an item becomes a law; most people think that all the hard work is done during the Common Council meeting when that's not the case. For instance, here's a CLEAR example of an ordinance which was hotly debated prior to the Common Council vote. This month, yet another ordinance was passed be the council and this particular piece of legislation had to do with the removal of debris. Although debris includes such items as leaves and such, I'm going to concentrate on the part of the ordinance that pertains to snow removal. In layman's terms, the city has a problem with a handful of snow removal contractors who push snow into the street. I'm not going to get into any detail in terms of who does this nonsense and where it happens (just think of places that have parking lots for instance), you can learn all about it by watching the debates in the following videos. According to the public works department, this has been an ongoing problem for sometime so they came up with a proposal that will fine any homeowner who pushes snow into the street 90 dollars. This means if you have someone plow your driveway and they push snow into the street, YOU the homeowner will be responsible and fined accordingly. Sounds kind of silly on face value right? Well, that's why we have a process in place in the city where members of the common council as well as members of the public can offer their input, which in turn allows people an opportunity to change laws before their submitted for approval. In the case of the debris ordinance, what was finally passed during the December Common Council meeting was somewhat different than what was proposed. Although I'm still not in total agreement with the final outcome (and the fact that this particular council has a history of passing too many useless unenforceable ordinance which are based more on politics than necessity), hopefully because of the compromised amendments added to this proposal, this will be a rarely used ordinance and no homeowner will ever have to pay a fine. Now this post is going to be rather long...in fact, if you watch all the video, it's going to be VERY LONG...BUT if you really want to know how something becomes law, this is it. Okay, so you want to see non-partisan local democracy in action? Here we go. the proposed ordinance to address snow removal problems. After a ordinance is proposed, it usually goes to what's called an ad-hoc committee for review. The term ad-hoc means "for this purpose"; therefore, an ad-hoc committee is established by the common council to focus on examining a specific subject on behalf of the entire common council. The ad-hoc committee is usually reflective of the make-up of the council which means that it's usually conducted by a Republican and has Democratic minority representation (this is due in large part by the fact that the Republicans control the council by a 2/3 veto-proof majority). You following me so far? Okay, lets move on. Back in October, the ad-hoc committee met to discuss the removal of debris ordinance proposal and there was some rather heated debate on this issue. Concerns over the ordinance ranged from the ordinance in general being a hardship on taxpaying homeowners, to debate over how the ordinance going to be enforced. In a somewhat rare case, the items of disagreement didn't fall along party lines (which is why following this particular ordinance should be informative to all who want to have an understanding on how things COULD and SHOULD be done in the city if politics was removed from the equation). Pay particular attention to Councilman Fred Visconti and Gregg Seabury's remarks as this items will come up again in other meetings. After an ad-hoc committee is done, the next step (in most cases) is the proposal going to what's called a public meeting and committee of the whole. In a nutshell, a public hearing is where the public can offer input and their opinion on a the proposal and a committee of the whole is exactly what it sounds like, a committee of the entire common council. During the public hearing, members of the public offer their input on the proposals and in some cases, the comments from the public can have an impact of the minds of the council. I'm going to skip the public's input because for the most part, the comments were pointless. I've already posted about the offensive and idiotic remarks offered from the racist email xenophobe Pauline Basso (who's rant just about pissed off everyone on the council). 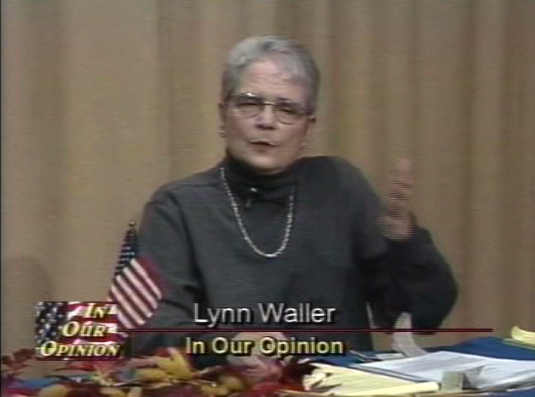 The other comment offered by Lynn Waller is not really worth mentioning within this post because a.) someone like her should have known the answer to her concern regarding why the city picking up certain leaves on certain streets and b.) she didn't give the the Common Council the common courtesy of listening to the entire debate as she (accompanied by her BFF Basso) walked out before the head of the public works answered her concern. If requested, I'll do a separate post on Waller just as I did Basso. 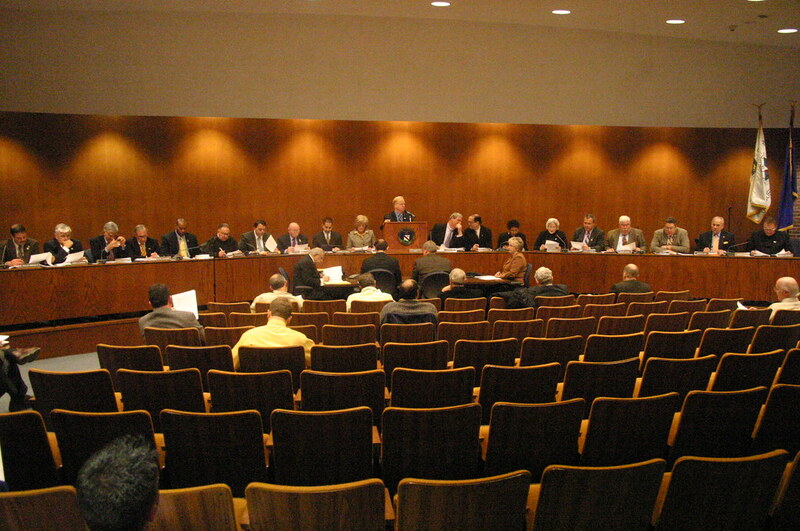 Okay, here's footage of the committee of the whole discussing the ad-hoc committee's review of the ordinance. Again, remember the concerns from Councilman Seabury and Visconti as well as my concern that this is yet another ordinance that places a burden on property owners on the city and how that was worked out by minority leader Tom Saadi's amendment to the ordinance. Other tidbits which really have noting to do with the ordinance but made for some inside baseball drama was the way in which Councilwoman Coleen Stanley is dismissed by Common Council President Joe Cavo and the way in which he didn't allowed her to speak any further on the item (I'm sure that led to some type of discussion after the meeting). Now, as you can tell from the video, the concerns from the ad-hoc committee flowed over to the committee of the whole and minority leader Saadi's amendment offered some clarity to the overall ordinance, which in turn led to the ordinance being approved. Okay, here we are. This is the part of the show where most people see on T.V. or read about in the newspaper...the final vote and approval from the Common Council which makes the ordinance law. As in the committee of the whole, the public is offered an opportunity to speak in favor or against the item, which could persuade members of the council in their vote. In this case, although there was no one from the public speaking on this ordinance, minority leader Saadi took the time to discuss the amendment for the members of the public who watch the meeting on TV. Here's a copy of the minutes from the committee of a whole as well as the copy of the ordinance which was voted on. NOTE: Due to a screw-up by the person responsible for the city's government channel, Ted "you're doing a heck of a job" Cutsumpas, the meeting was not recorded. Unless someone recorded the live broadcast, my footage is the only copy of what happened...and unfortunately, I didn't record the entire meeting. NOTE: If you recorded the meeting when it was broadcasted live on Tuesday, please get in contact with the city of Danbury so that they can copy the tape and re-broadcast it on the air). Okay, there you go! That's basically how democracy works in Danbury. Basically how an ordinance becomes a law in Danbury. It's important to note that an item can stay in ad-hoc committee for an indefinite amount of time...this is basically how the city kills a proposal and I'll get into that subject at a later time. For those in my generation, if you remember the following video, you have basic understanding on how things are done on the local level (although the mayor doesn't have veto power, he, like the president of the US Senate, can only vote when there is a tie on the common council. Also, in relation to a veto, the people can force what's called a referendum on any ordinance after it's passed but the process is rather complicated and this post is long enough as it is).